Between Ryan Braun's impending fate and the news that Prince Fielder has signed with the Detroit Tigers, baseball is on everybody's minds. Pitchers and catchers will soon report to spring training and Brewers Opening Day is only a little over two months away. Better remove your grill from storage so that you are ready to fire up the bratwursts on April 6th for the Brewers vs. Cardinals at Miller Park. I don't know about you, but I cannot wait for baseball season. 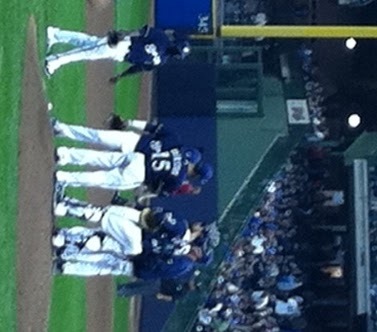 After last year's exciting playoffs run, I can't wait to see what the Milwaukee Brewers will do this season. I'm not worried about any of the personnel changes, I know the Brewers will still have an exciting season. Go Brewers! Now the question is, how many games can I make it to this season? Ten? Twenty? All of them?